Just Another Day...: Potty Time!! UPDATED WITH A VIDEO BELOW!!! The boy has surprised me beyond belief already! I seriously was worried he wasn't ready. We talk about pee-pee on the potty, but he hasn't been too interested in actually doing it. But I've been talking it up for the past few days and he "seemed" to be on board with the idea. He woke up this morning and I had out his potty (complete with a few new Cars stickers on it) and a stack of big boy underwear. I asked him to sit on the potty before breakfast and he had a lovely little meltdown. I decided not to push it so I asked if I could change his diaper before breakfast. He agreed and I took off his damp diaper and left it off. I then proceeded to get his breakfast ready. He seemed a little confused and asked about putting his pajama pants back on but I told him his Pop-Tart (don't judge) was ready, so he ran over and climbed into his chair at the table. He didn't seem to mind the fact that he was wearing nothing but his pajama shirt! During breakfast, he told me he pooped. GASP! I went over to check and saw that he had peed in his chair. No worries! I explained that it was pee-pee, not poop, cleaned him up, and he went back to his breakfast. After he got down from breakfast, he headed into the play area off the kitchen and a few minutes later he said something (can't remember what) and I looked up to see he had peed on one of the foam alphabet letters. No worries! I told him it was okay, but that we want to make sure the pee-pee went in the potty (which was sitting 2 feet from him in the play area). That, my friends, as of this writing at 2:00 PM, was his LAST accident so far today!!! I can't even begin to believe it!! Boys are supposed to be much harder than girls, but he's so far proven to be just as easy as LO was to potty train! Keeping his bottom half naked with free roam of the house has been working wonderfully! I can't believe that he'll even stop in the middle of an activity (Wii, board games, etc.) 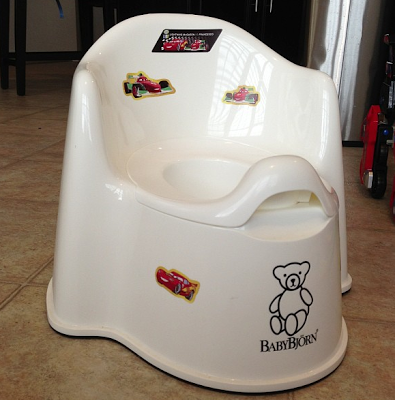 to go sit on his potty and go pee-pee! AAAAAAAAAAAAHHHH! I'm so happy I can't stand it! Now I know this is only Day 1 and there's sure to be plenty of accidents ahead of us, but I'm just so impressed and proud of his progress already this morning. Simply amazing. I'll keep ya posted on how things progress (since let's face it, all of you are dying to receive potty updates from me)!